Class Requirement: Parent child activity. Parents must be involved for the duration of the class. 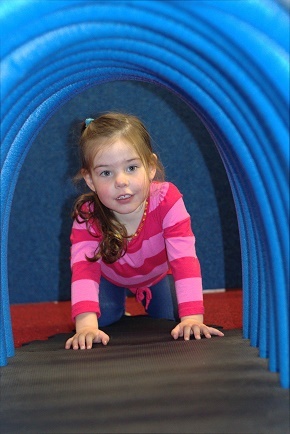 Come inside our specially designed Kindergym set ups! 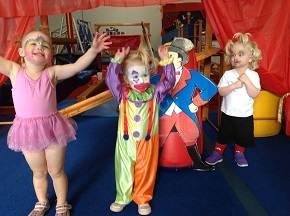 The gym is magically transformed into the theme of the week bringing excitement and joy to every lesson. 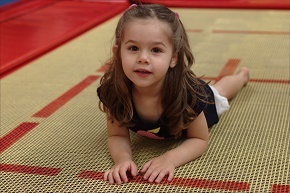 The gym set up is constantly changing giving your child a stimulating and challenging experience in a safe environment. Your child will develop skills such as social skills, listening to instructions, lining up and how to get along in a group environment. 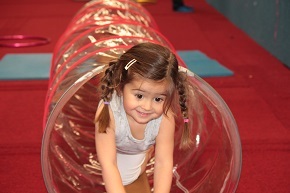 They will also learn the basics of gymnastics and movement such as jumping, rolling, balancing, fine motor skills and much more! We use lots of musical instruments and fun props as well as our trampolines and foam pit to enhance their enjoyment to the max! This class is a brilliant stepping stone to our Kinder Transition classes. 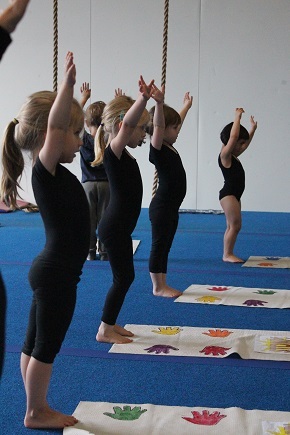 Uniform: No uniform is required and children participate in this class barefoot. We recommend shorts, leggings and a t-shirt for our Kindergym classes. For safety reasons we do not allow jeans, dresses or skirts (including ballet tutus). Enrolment: Enrolments are term by term and are open to boys and girls. Have a look at our timetable and enrol! Class Requirement: Parent child activity. Parents must remain on the floor with their child for the duration of the class. This is the next step up from our Kindergym program. 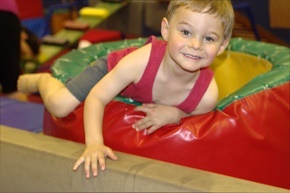 Our Transition classes have all the magical aspects of our Kindergym programs however; their group time and gymnastics skills are more advanced. 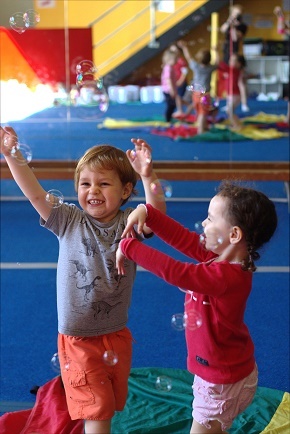 During these classes we teach the children to become more independent during their group time and when performing their gymnastics skills to prepare them for our Kinder Rec program which has no parent participation. We recommend shorts, leggings and a t shirt for our Kindergym classes. For safety reasons we do not allow jeans, dresses or skirts (including ballet tutus). Our Kinder Rec classes are for our independent boys and girls who are comfortable with being dropped off and being in a class without parent participation. These classes are aimed at more ‘grown up’ gymnastics with very structured classes containing the four gymnastics disciplines (floor, beam, bars and vault) as well as the favourite – our trampoline and foam pit area!! This is the perfect class for a gymnast that has progressed from our Transition class but is not yet at school. Uniform: A uniform is required in our Kinder REC program and can be purchased from our merchandise shop. Description: Our After School Recreational classes are for children who are 5+ years and would love to enter the world of gymnastics. 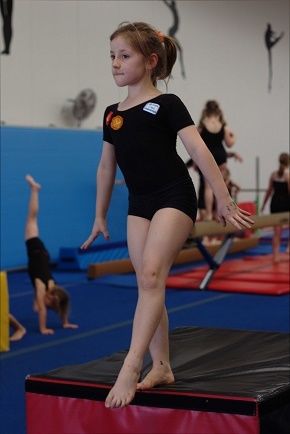 During these recreational classes the gymnasts will learn the four gymnastics disciplines (floor, beam, bars and vault) as well as strength, conditioning and trampoline skills in our trampoline and foam pit area. Each gymnast will go through our specially designed coloured grading system and will receive a certificate at the end of each term outlining the gymnasts’ progressions and skills competed. It’s a great way for children and parents to see what they have learnt and how much they’ve improved from term to term. Once a year we put on an optional gala for any gymnast who would like to compete the skills they have learnt in term 1 and 2. Uniform: A uniform is required in our Recreational program and can be purchased from our merchandise shop. Description: This class is designed for our advanced recreational gymnasts who have reached the Green grade level in our Junior Rec classes and are serious about progressing their gymnastics to the next level. They will follow a similar strength, conditioning and flexibility program as our competitive teams to achieve those more complex skills. Please note; Our Advanced Green Rec Squad is a recreational program therefore does not compete outside of our club. Description: This class is designed for our advanced recreational gymnasts who have reached the Purple grade level in our Junior Rec classes or have completed the Advanced Green Rec program. Gymnasts must be serious about progressing their gymnastics to the next level. Please note; Our Advanced Purple Rec Squad is a recreational program therefore does not compete outside of our club. 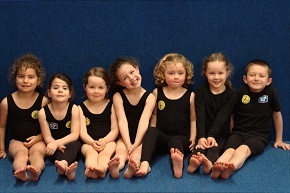 Description: Our very popular Tumbling classes are for gymnasts who would like to learn skills taught on the floor and trampolines. Tumbling is an acrobatic sport discipline which combines artistic gymnastics and full body stretching and conditioning. We have classes for beginner to advanced levels. Uniform: A uniform is required in our Tumbling program and can be purchased from our merchandise shop. Description: Our Senior Recreational classes are aimed for the older gymnasts 10+ years. They learn all the four disciplines of gymnastics as well as learning trampoline skills. The gymnasts follow our specially designed program. Beginners are very welcome into these classes. Uniform: A uniform is required in our Senior REC program and can be purchased from our merchandise shop. Our Ninja Warrior program is designed to be a fun and challenging class! Students in this program will participate in specially designed exercises to help them gain the strength, flexibility and skills to attempt the Ninja Warrior obstacle course successfully. It is designed to be high energy with lots of jumping, climbing, running and learning new skills and progressing at their own rate. Key areas to be mastered are body awareness, momentum, timing and technique. Uniform: A uniform is not required in our Ninja Warrior program.